Fresh ideas and practical solutions for everyday life. Some days you just want a treat. 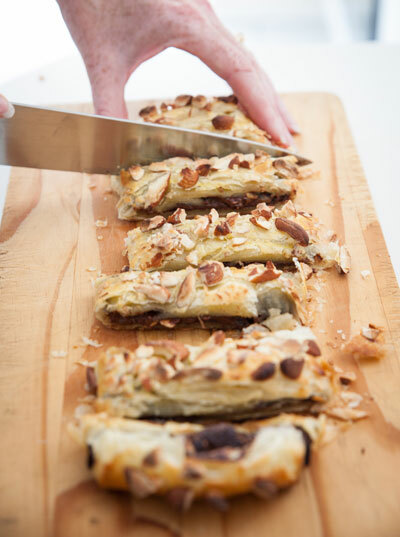 Or you want to whip up something truly decadent to show off to your friends. 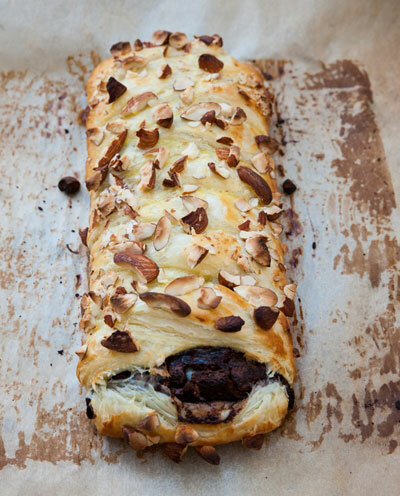 If you’re having the girls over for coffee, this braided pastry is quite the sweet treat. 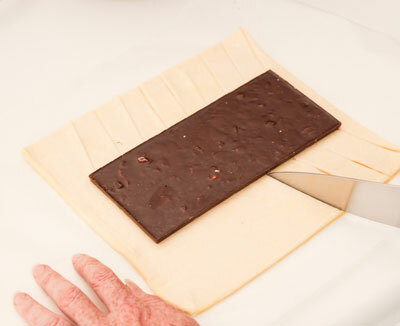 It uses an an entire chocolate bar, but hey – it’s OK to indulge every now and then, right? Preheat oven to 200deg C (400deg F). 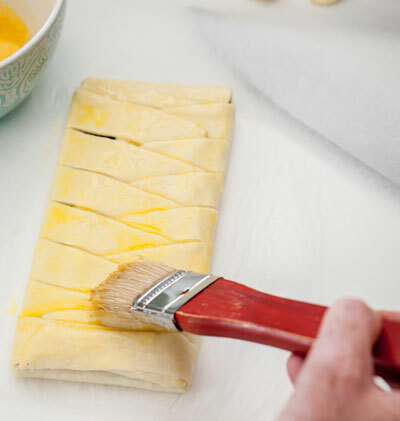 Lay out the puff pastry. 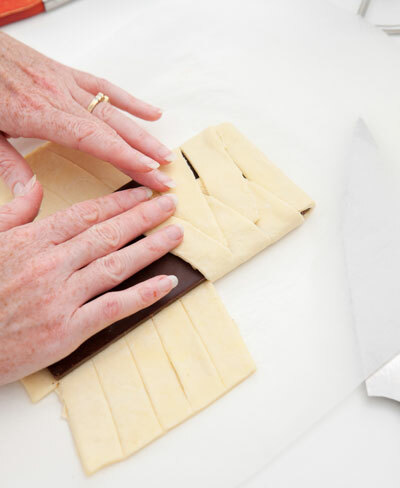 Place the chocolate bar in the centre of the pastry and cut diagonal lines on the left and right sides of the bar, as shown. Remove the corner pieces but not the top ‘flap’. Starting from the top, fold down the flap then alternate right and left, folding over the diagonal pieces until you are near the bottom. Fold the bottom flap up over and finish folding over the remaining diagonal pieces. 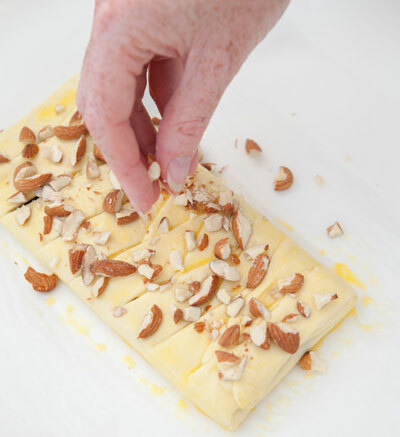 Brush the braided pastry with the beaten egg, then sprinkle over the crushed almonds. Bake in oven for 25 minutes or until golden brown. hem, i like it, may i try? 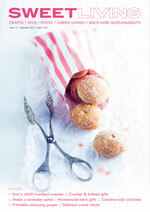 A FREE online magazine to inspire and delight. Ideas and practical solutions for everyday living. Signup for Sweet Living's free newsletter. WHAT KNITTING/CROCHET PATTERNS WOULD YOU LIKE TO SEE HERE? You can now access Sweet Living Magazine everywhere you go. Enjoy the best mobile reading experience and share it with your friends.